Zagreb, Yugoslavia. Language: Croation. Publisher: Zagreb Theosophical Society in Yugoslavia. 1/1, 1939. 4-12 typed and mimeographed sheets. 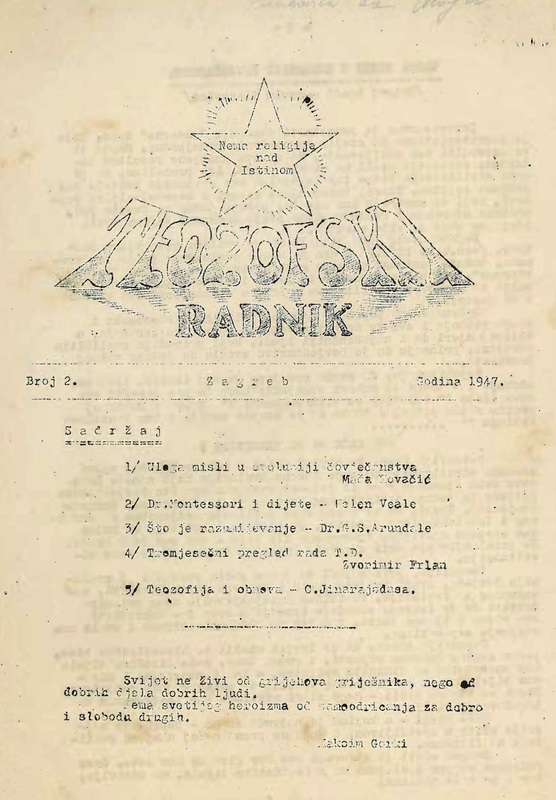 This was the bulletin of the Adyar Theosophical Society in Yugoslavia. From Nemanja Radulovic: Teozofski radnik [Theosophical Worker]. Zagreb, Theosophical Society in Yugoslavia. Bulletin (c. 10 pages) with translations of Theosophical articles, news and reports from the Theosophical world in Yugoslavia and abroad; official statements of the Society’s president to the members. Typed and reproduced. In 1946 the Theosophical Society in Yugoslavia was banned by Communist government (the ban was lifted in 1966.). Only partially preserved: nr. 9-10. (October-November) 1939; June-July 1940; 1946, 1-7; 1947.nr.2-5. Available at: http://www.jivatma.si/gradiva/starejse-revije-casopisi/teozofski-radnik.